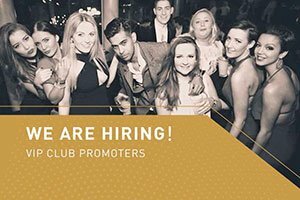 The Toy Room Club is an exclusive luxury club offering a unique RnB and Hip Hop experience to the elite clubbers of London. 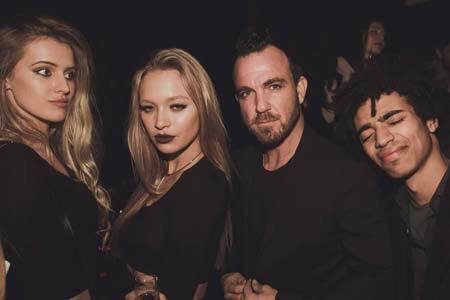 The club has a strict door selection which requires you to be on the Toy Room Club guestlist in order to get inside. You have to make sure that you follow the Toy Room dress code in order to avoid getting rejected at the front door. Be at your best smart casual attire and dress to impress as you strut your way in this stylish bar. 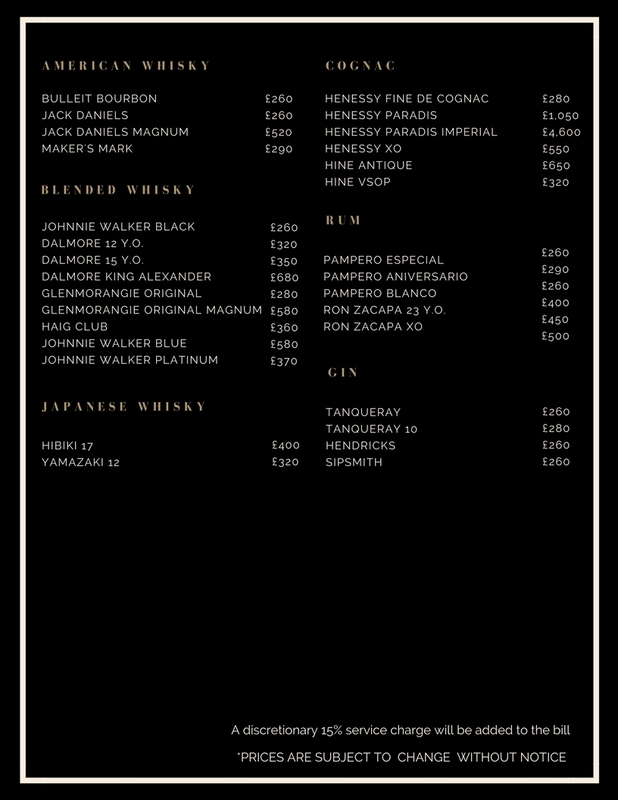 For more details about the drinks and bottle prices menu for Toy Room Club, please see the image below so you can choose the best and make the most out of your parties. 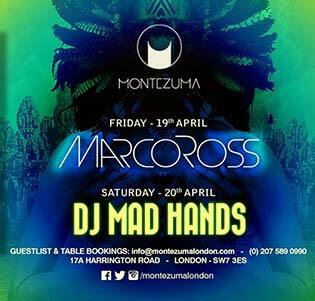 This intimate club offers a high quality and definitely glamorous partying experience for clubbers so make sure you get your Toy Room table booking through London Night Guide. Toy Room offers American, Blended and Japanese Whisky, Cognac, Rum, Gin, Champagne, Vodka, and Tequila. Each with a set of different brands to choose from. Individual bottles range from £260 whiskies up to £33,000 champagnes. With their wide variety of choices, there will surely be a bottle for your taste and budget. WHAT IS THE TOY ROOM BOTTLE PRICE MENU? 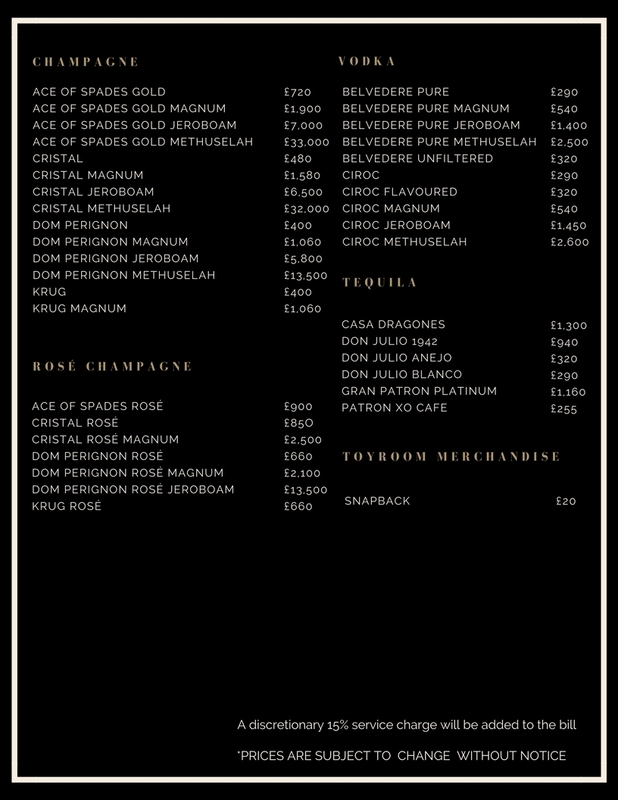 The Ace of Spades Gold is a an elite choice among the champagnes ranging from £720 to the most expensive Gold Methuselah, a fruity champagne in a gold exquisite bottle, at £33,000. The drink has a reputation as a party Champagne and is believed to be the only one available in a 30-litre ‘Midas’ bottle. With Jay Z being part owner of the company, the brand has been given a spotlight in the hiphop scene and starting to be famous among his fans. “If you put aside the bling bling packaging and the high price tags, the content of the bottles is actually quite impressive,” said Christelle Guibert, Decanter’s tasting director, after sampling the range. The stylish interiors and the premium drinks will definitely give you a prestigious clubbing experience at The Toy Room. 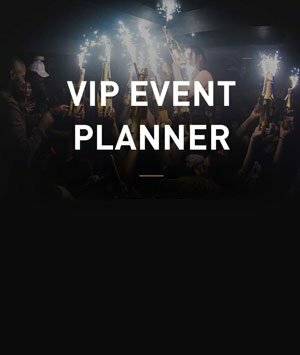 Enjoy a night with your friends or celebrate your birthday party here to have one of the best parties of your life. 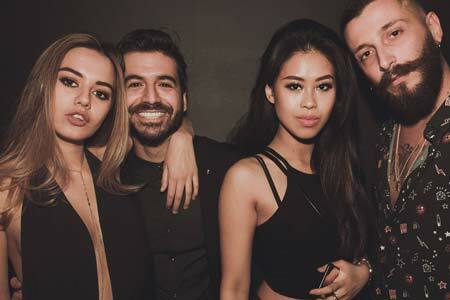 Make sure you book through London Night Guide in order to grab the best exclusive deals.